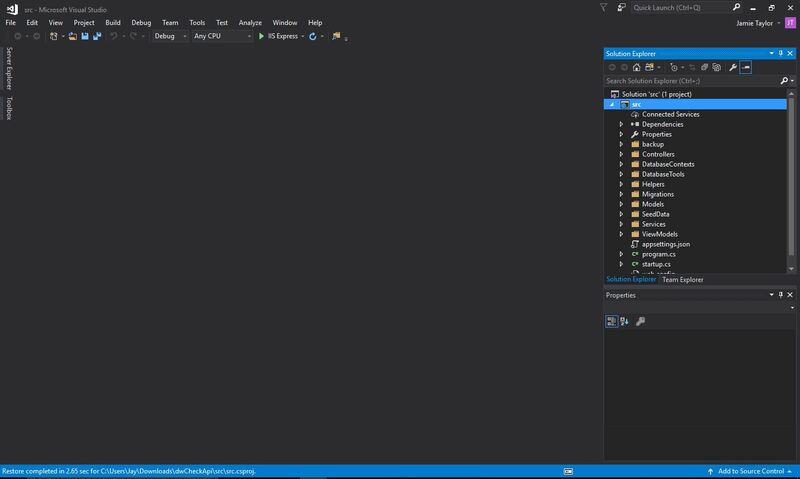 This week, the eagerly awaited, Visual Studio 2017 was released. To name only a few things. 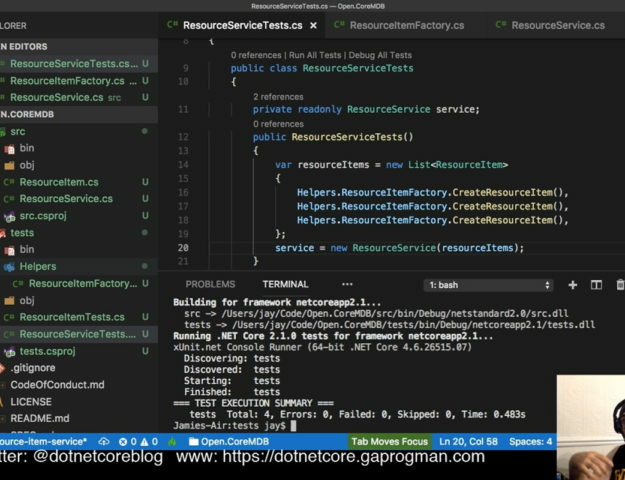 In this post I though I’d write about something that we all need to be able to do with our .NET Core projects going forward: migrate from project.json to csproj/MSBuild format. I’m about to drop a little history on you, but if you want to skip it and go straight to migrating project.json to csproj, then click here. I don’t know about you, but I find the project.json file easier to read. I didn’t need to dig that far, .NET Core hasn’t been around that long yet. Back when .NET Core was first being developed, the ASP.NET and the .NET teams weren’t working together. The ASP.NET team where working on .NET Core, which would run on the .NET team’s new .NET API surface. The ASP.NET team took this opportunity to re-build the project format from the ground up, as .NET Core was seen as a new beginning for .NET. Once the open source community got their hands on the .NET Core betas and early releases, work started on the next generation of web applications using it. Most developers liked the new project format, and celebrated it for being simpler and it’s support for auto-complete. While the Release Candidate was being planned, it was decided that .NET Core would have to support MSBuild. 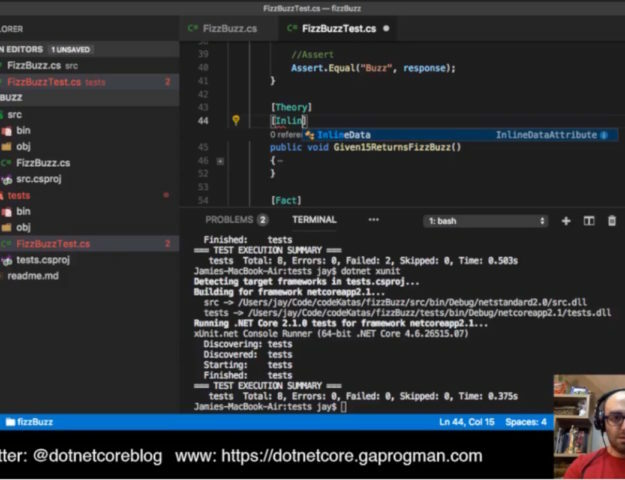 MSBuild is a series of tools which allow DevOps folks to automate the building and deployment of .NET projects. MSBuild does not support the new project.json format, which put a lot of people off. Especially those who wanted to convert their already established .NET Framework projects to .NET Core. 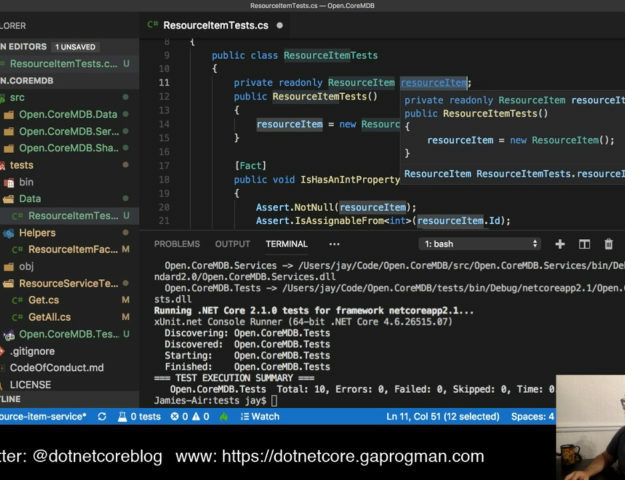 Starting a new .NET Core application wasn’t an issue, but not many enterprise solutions or big business applications were going to be re-written from the ground up. Because of this the .NET Standard team decided to retire the project.json format and give .NET Core support for the backward compatible csproj format. 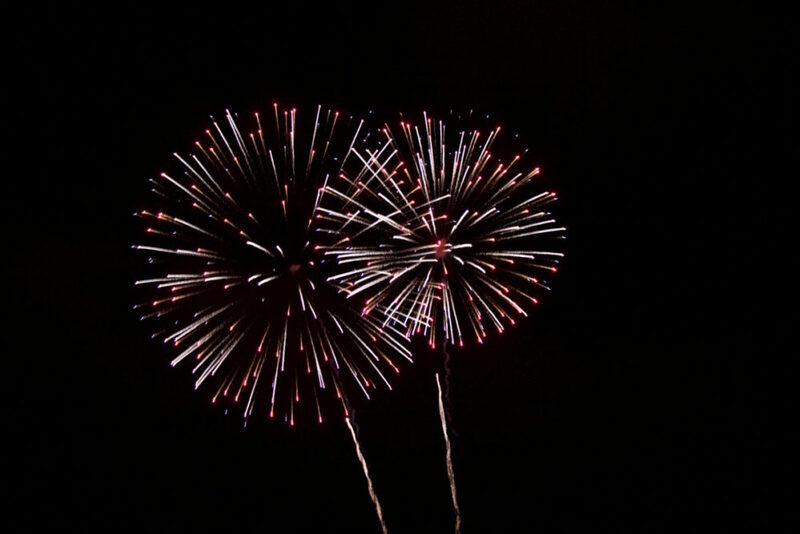 But not only that, the decision was made to simplify the format. How Do I Convert My Project? Everything we’ve done so far, has been in the terminal, mainly because the tooling hasn’t been the most stable. But now that Visual Studio 2017 has moved out of Release Candidate and has shipped with version 1.0 of the .NET Core tooling, we can start working with that. Either way, the first thing that you’ll want to do is update the version of the SDK that you have installed. If you’ve installed Visual Studio 2017, then that’s already been taken care of for you. However, the latest version of the SDK is available for download here. Obviously, the version numbers are going to change as Microsoft adds releases new versions of the .NET Core SDK, but the version I’m using as I write this post is: 1.0.0-rc4-004771. Next we need to check that the version of the .NET Core SDK we have installed has the migrate command – which is used to convert to the new csproj format. dotnet --help | findstr /I "migrate"
migrate Migrates a project.json based project to a msbuild based project. Which shows that our install of the .NET Core SDK supports the new csproj format and can convert from project.json to it. Ok, “worked example” is probably not the right phrase, but stick with me here. and we’ll convert it to a csproj project right now. Project src migration succeeded (/Users/GaProgMan/Code/dwCheckApi/src). The project migration has finished. Please visit https://aka.ms/coremigration to report any issues you've encountered or ask for help. If try to build the application, you’ll get a bunch of errors. I got 439 errors, and the first time I did this I was worried that I’d broken my application beyond repair. Thank goodness for source control, huh? But, as any developer worth their salt will tell you, always read the error messages. So let’s take a look at the very first one. 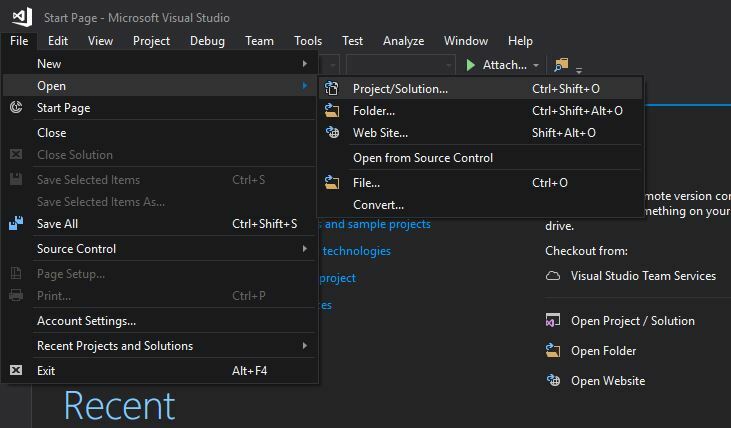 Migrating using Visual Studio 2017 is easier than using the terminal (especially for those who prefer to use a GUI), and it’s a case of opening a project.json project after which a wizard will guide you through migrating to the new format. Beth Massi gave a demonstration on how to migrate a project to the new csproj format. At the above link, if you jump to 35:30, you’ll see Beth showing how it’s done with an xproj solution. The short version is that you just open the xproj file with Visual Studio 2017 and it starts a migration wizard. This does require you to have worked on your project in Visual Studio 2015 (as xproj is it’s default format for .NET Core projects). The project format in commit 6402447aec of dwCheckApi was project.json without an xproj file (because I had been working exclusively in VS Code with the command line). 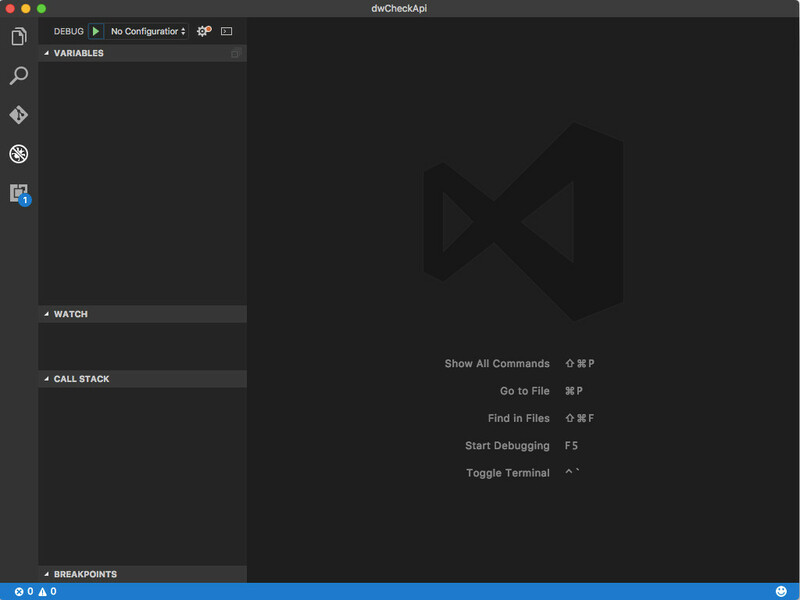 If your project does not have an xproj file, I recommend that you use the command line tools (mentioned above) to migrate your project, then open the MSBuild version with Visual Studio 2017. However, here are the steps that you need to take with an xproj project. Then we want to find the xproj file, opening this file will show the migration wizard. 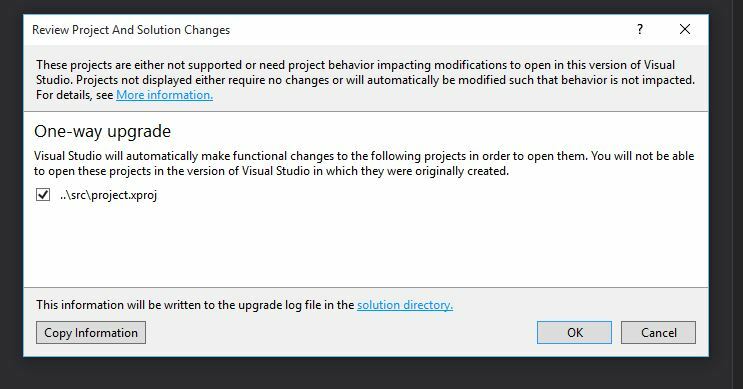 When the migration is complete, the csproj project will be loaded into Visual Studio 2017 and all packages restored. Let’s take a quick look at the new csproj format to see how it’s changed from our project.json. But, it’s more concise and has fewer lines (even with the empty lines inserted). If you open a freshly migrated project in VS Code, and try to run it you’ll see a few strange things. Clicking on the run button will cause the command pallet to extend and give you some choices. There are a few issues with this file (I’ve highlighted them), and we’ll come back to them in a moment. We’ll need to configure a task runner to be able to debug this application, so let’s do that. I chose .NET Core, but you should chose whatever suits your project. Now then, we had issues with our launch.json. To see what they are go ahead and click the run button again. What’s happened here is that the first two configuration entries in out launch.json have badly formatted entries. Neither of these are valid entires for the launch.json. What we need to do is replace them with valid strings. It’s pretty simple really, we need to do is look at our csproj for our target framework and the assembly name strings. Clicking run one last time, should build and run the application for you. Moving forward, all .NET Core projects will have to be csproj ones (in order to benefit from all of the features of the new versions of the SDK, anyway). Migrating to csproj is relatively painless, as long as you’re aware of some of the potential edge cases and issue areas ahead of time.